2017 Leaf Pearl has been teased by the card maker for a while. The new super-premium line has a lot of moving parts coming from several sports. Already promising a roster of Hall of Famers and other big names, 2017 Leaf Pearl also has Shohei Ohtani autographs. The product is a mix of high-end elements from across the sporting spectrum. Baseball, football, basketball, soccer, hockey and more are represented on the checklist. And virtually everything is numbered to 10 or less (If it’s not an Ohtani autograph, it’s got no more than ten copies.). 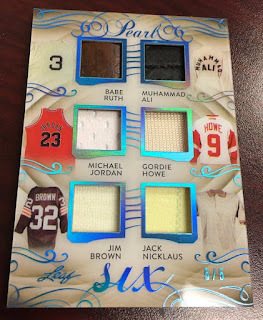 Base cards live up to the set’s name with a pearl included similar to how Panini Flawless uses gems. 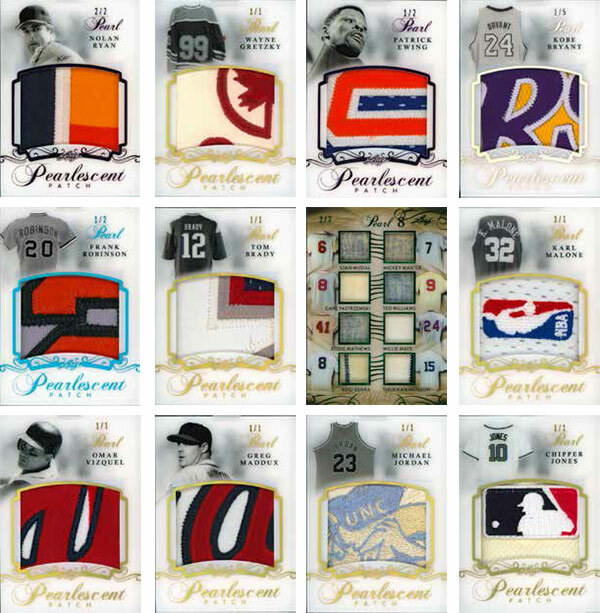 2017 Leaf Pearl base cards (/10) are done on a milky stock, further sticking with the theme. 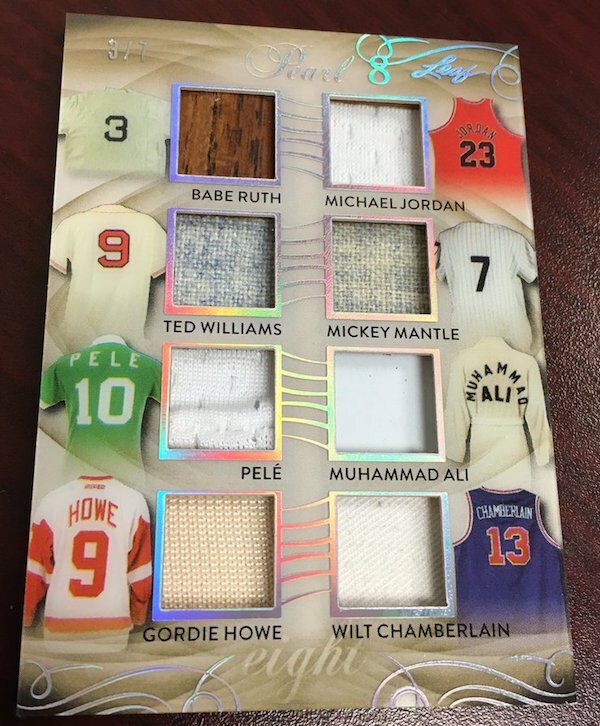 Parallels come in five levels numbered down to 1/1. Base Signatures use a similar design. 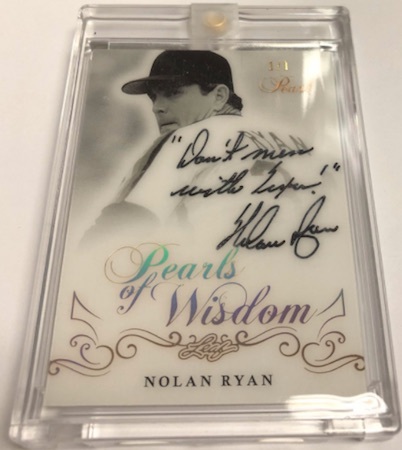 Signers include Pele, Nolan Ryan, Floyd Mayweather and more. The Shohei Ohtani autographs are done a little differently. Design-wise, they match the Base Signatures. However, there are five different cards, each using a different photo. None of these have parallels, although each is numbered differently. One of the five 2017 Leaf Pearl Shohie Ohtani autographs is numbered to 40. Another has 25 copies, then /10, /5 and finally a 1/1. This adds up to 81 total Ohtani autographs in the entire production run of just 300 boxes. Bringing it back to the legends, Champions Signatures have ink from players who have won their respective sports’ biggest prizes. John Elway, Jerry Rice and Magic Johnson are among the ‘graphs here. Barry Sanders and Larry Bird are among those with Paragon Signatures. These combine the autograph with an over-sized swatch. 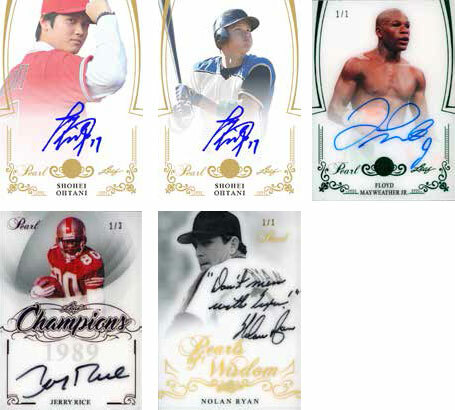 If a 2017 Leaf Pearl box doesn’t have an Ohtani autograph, it does have a cut signature. Pearl Cuts subjects go beyond sports. Marilyn Monroe, Tupac Shakur, John F. Kennedy, Lou Gehrig, Abraham Lincoln, Michelle Obama and Donald Trump are a sample of the variety. History Book Cut Signatures fold out to include not only the autograph but a massive piece of unique memorabilia. Babe Ruth and Mickey Mantle are both a part of the checklist. Memorabilia cards come in several themes. 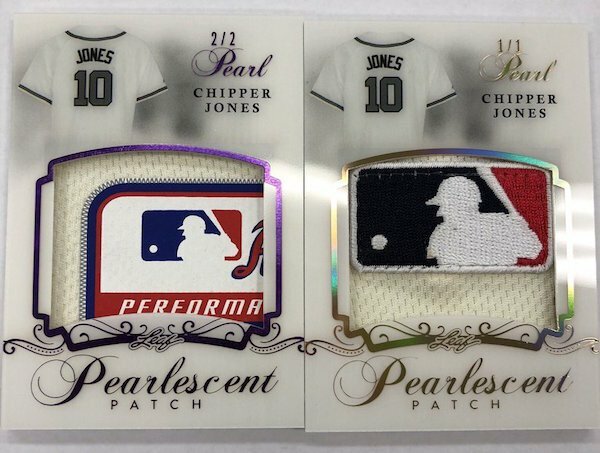 Pearlescent Patch cards all have jumbo patch pieces. Both game-used and player-worn jerseys were used to make these. Covering several generations, Michael Jordan, Wayne Gretzky, Tom Brady, Patrick Ewing, Kobe Bryant, Chipper Jones and Eddie Mathews are among the subjects. Rare Materials cards have five swatches from the same legend. 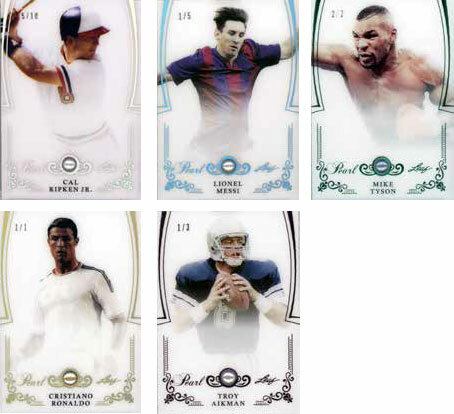 Jordan, Ruth, Ted Williams, Thurman Munson and David Beckham all have cards here. 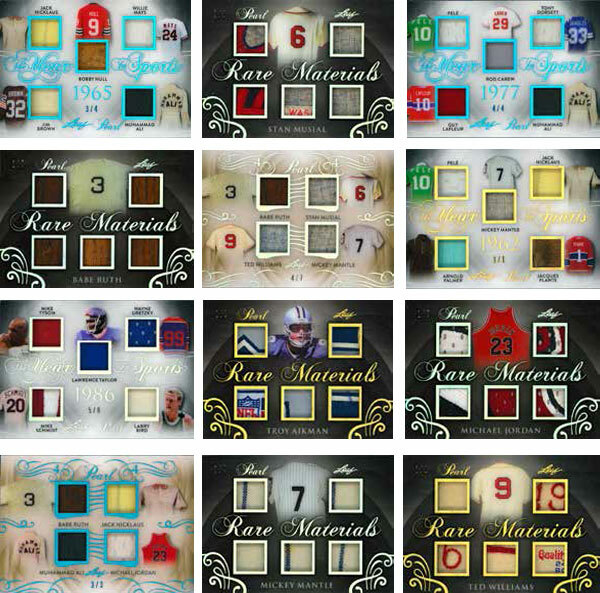 Multi-player memorabilia cards come in a couple of different themes. 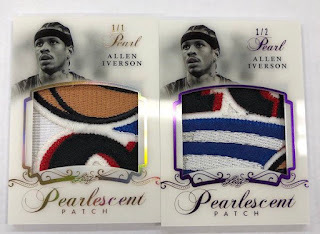 Pearl 4, 6 and 8 cards come with swatches from a matching number of legends. The Year in Sport highlights five players who all made a big impact around the same timeframe. 2017 Leaf Pearl has a production run of 300 total boxes. That works out to just 150 two-box cases. Do the math. That's less than 3 per state since some of these are going overseas. 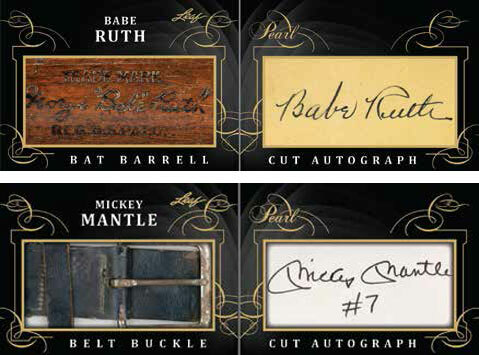 ---- Cut Signatures include Marilyn Monroe, Tupac Shakur, John F. Kennedy, Abraham Lincoln, Michelle Obama and Donald Trump, Mickey Mantle, Babe Ruth, Lou Gehrig and more. Expect some amazing late additions from Leaf.